I went to the University of Texas at Arlington. I hold a bachelor degree in Interdisciplinary Studies, a minor in Linguistic and a TESOL certification from the university. In the education program, I study Mid-level 4-8 Generalist for two years and gain a lot of teaching experience through student teaching and field practicum before I graduated in 2017. I am currently teaching English in South Korea. I teach 4th, 5th and 6th grade. I also teach adult English at the Elementary school to teachers. Before I came to South Korea, I was a substitute teacher at the International Leadership of Texas. Below are also teaching experience I have gained during my studies at my university. Student Teaching, AISD (Arlington Independent School District): (January 2017- May 2017) Completed 16 weeks of student teaching. Including 8+ weeks of supervised solo teaching, 8 formals and 2 informal observations. Senior Field Practicum, AISD: (August 2016-Present) Completed 10 weeks of student teaching and observation, including 4 informal observations. Junior Field Practicum, AISD: (August 2015-2016) Completed 80+ hours of observation which included leading small group. Arlington Reads: Internship in TESOL to reflect on teaching and learning. Performed teaching responsibility in an ESL/EFL environment. Login or purchase this resume contact details. 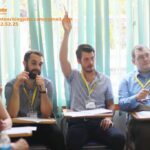 Vietnam Education needs native English teacher !